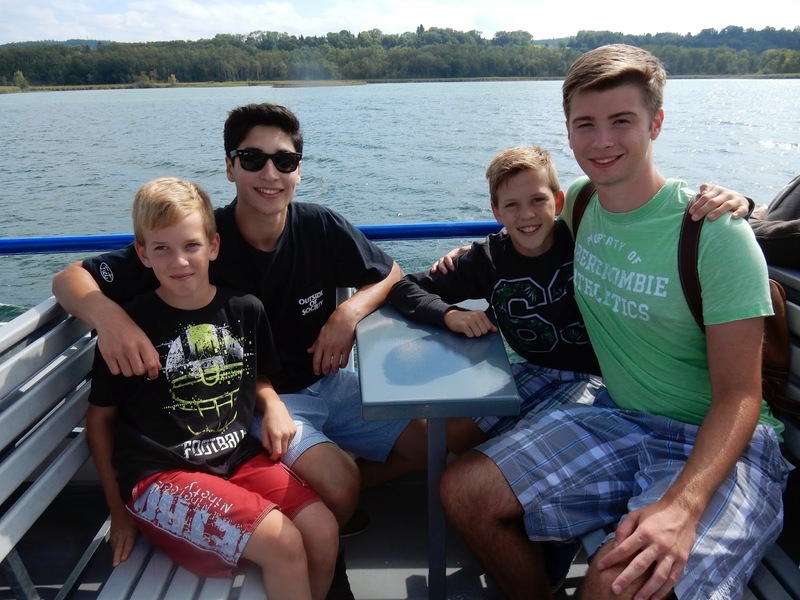 Every year, in September, Neuchâtel Junior College students are encouraged to get to know their new community before they venture farther afield. 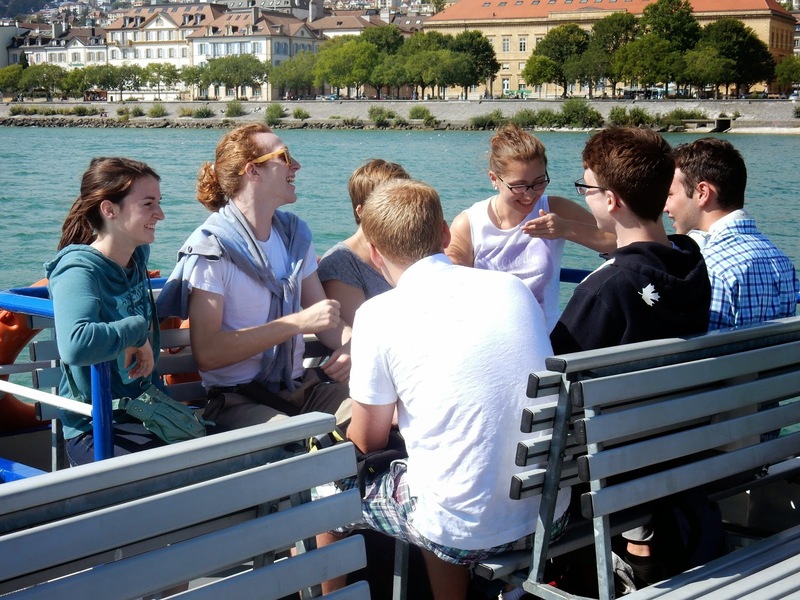 This is a pleasant task, since the Canton of Neuchâtel has a great deal to offer, as we have learned over the past two weekends. 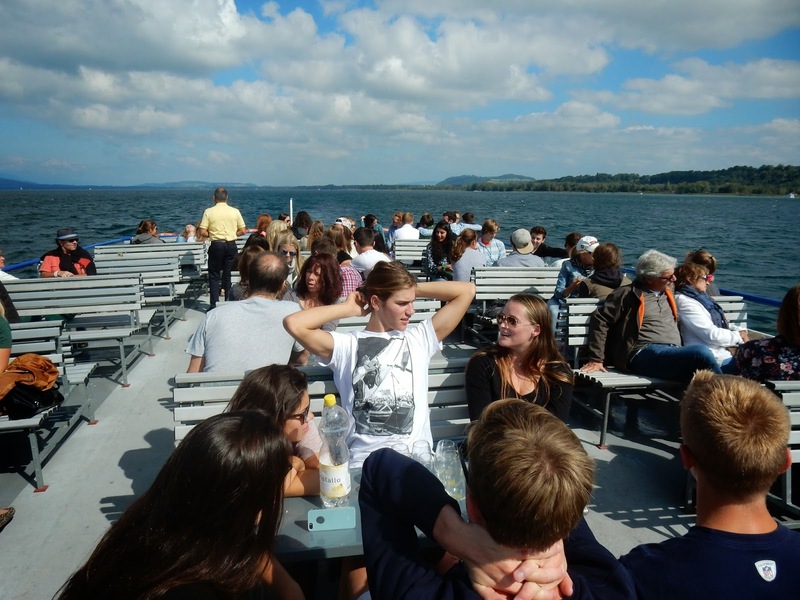 On Sunday, September 14, we all visited the lifeblood of the area, Lake Neuchâtel itself. 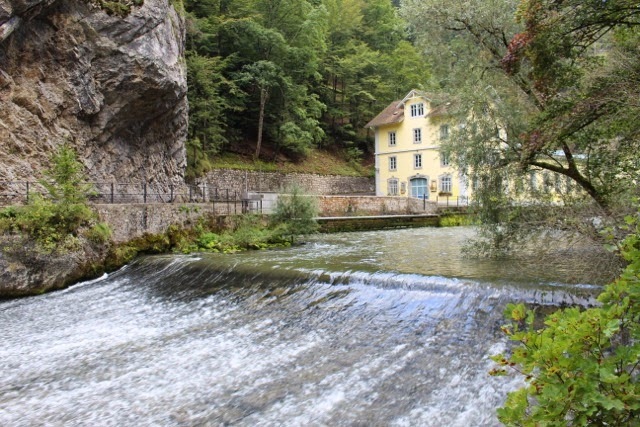 It is the largest body of water contained completely within Switzerland, and it is beautiful. On this day, the weather gods smiled at us. It is hard to imagine a more glorious day for a cruise. For the students, this was an opportunity to spend some time with each other, with their teachers, and with their pension families. 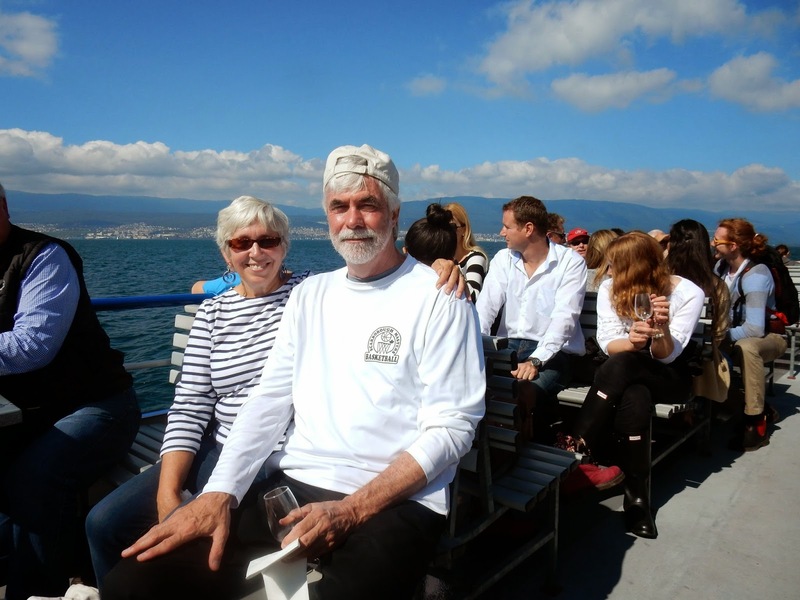 It seemed we had the boat to ourselves, and for an hour, we basked in the sun, rolled gently on the water, and enjoyed a glass of wine and light snacks, all the while mingling with each other. Personally, I loved every minute! All smiles on this day. 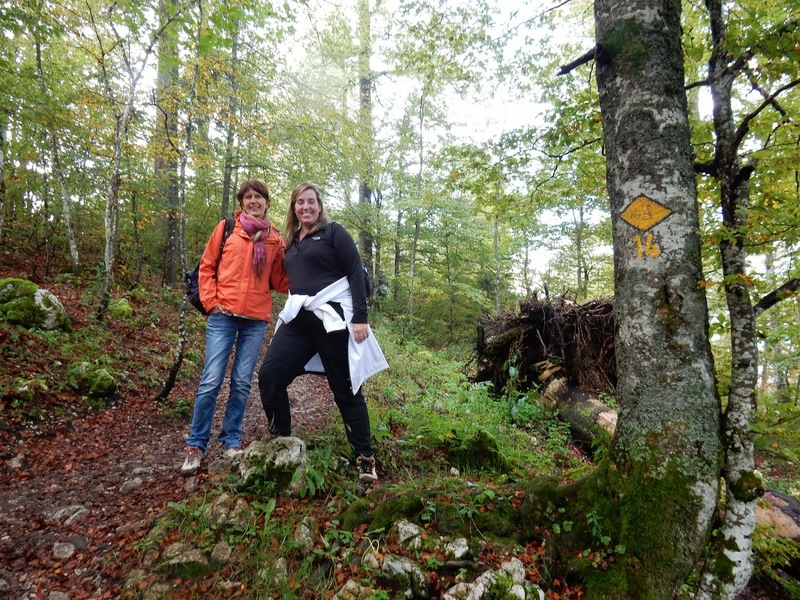 Eight days later, on a holiday Monday, September 22, students and staff took part in outdoor activities in the countryside not far from Neuchâtel. We were given the option of taking on a "défi" (challenge) or a découverte (discovery). A certain number of both of these tasks are required in order for the students to earn their school certificates. I do not know how many the teachers are supposed to do. Abandoned building in the gorge. 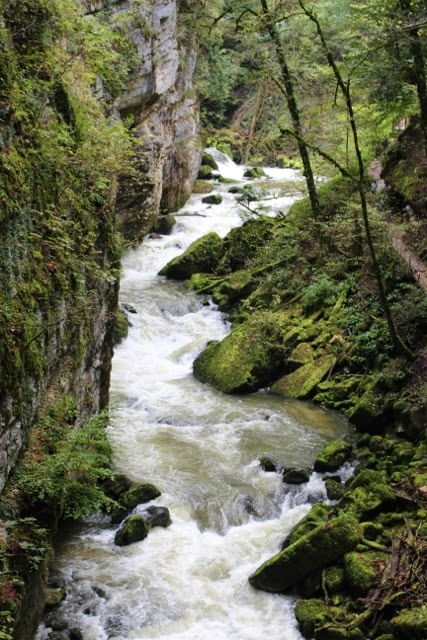 The majority chose the less taxing découverte, a walk in the Gorge de l'Areuse. A short train ride brought the group to this part of the Canton, where they spent about two hours walking in the Areuse ravine. 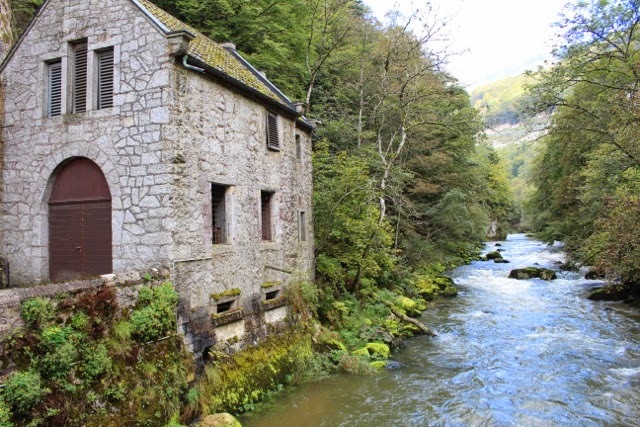 There was a variety of terrain there, from paved roads to rocky, narrow paths, to stairs to change levels and bridges that zigzagged across the river. Thanks to Erin for providing with photos. Rapids - it would have been fun (but dangerous) to raft here. 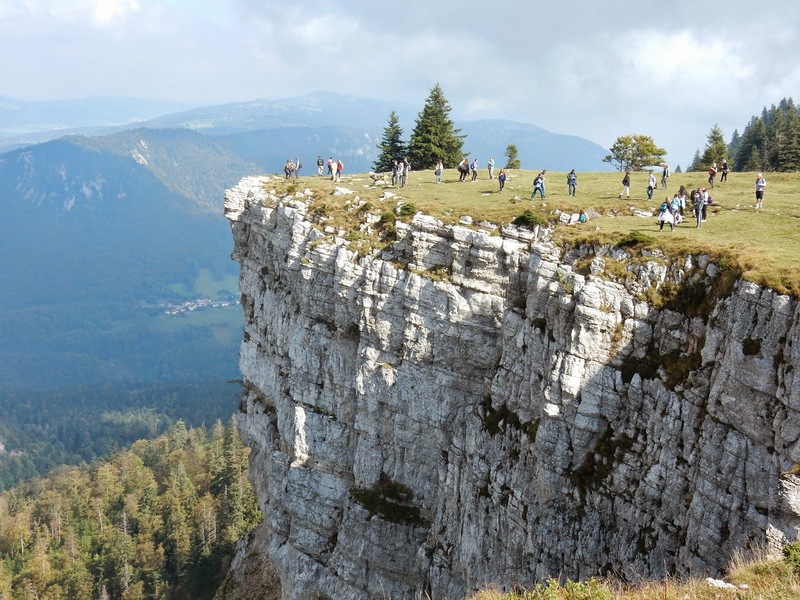 A smaller group, including our friends, Sally and Don Plumb who are visiting Bob and me, chose to challenge ourselves by climbing to the Creux du Van, the highest point of a canyon in the Jura Mountains. I was assured beforehand that I could accomplish this task, so I broke out my new hiking shoes and trekking poles for the occasion. I certainly needed both. Our guide, Christine, and Jen having survived the ascent. From our starting (and ending) point, La Ferme Robert, we headed up a gently sloping road until we hit a seemingly vertical hiking trail with fourteen switchbacks. This was the most difficult climb I have ever undertaken! The narrow path was often wet and muddy with slippery tree roots and rocks to climb over along the way. As a result, I took my time, while the students, and staff leader, Christine Weibel, had much less difficulty ascending to the top. Sally and Don were impressive climbers as well, but Jen and Bob trailed the group, taking even more time than I did. We were the tortoises among a large group of hares. 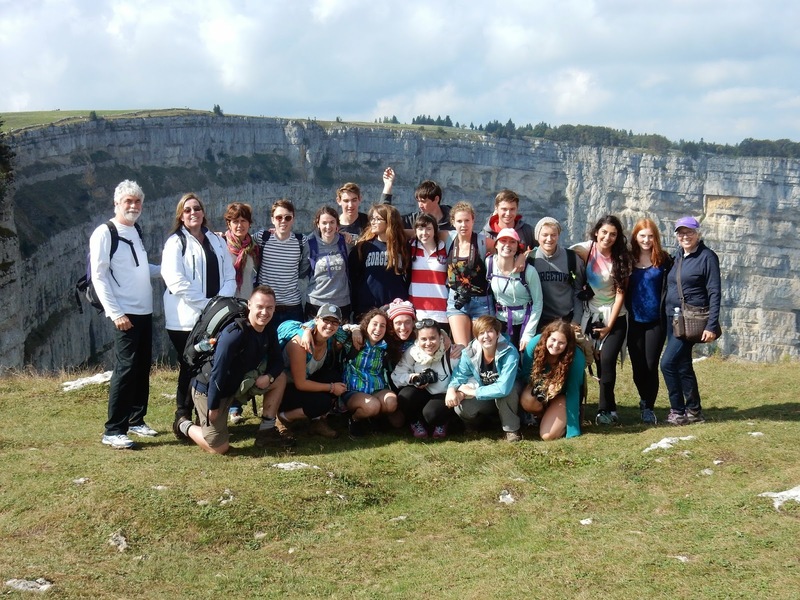 The Creux du Van crew in front of the canyon. I am one of the dots on the edge of this cliff. Truly awesome! When we arrived at the top of this part of the world, all our efforts were rewarded by spectacular views. The pictures here do not fully capture the beauty of this scene. The day, while cool, was clear and sunny. 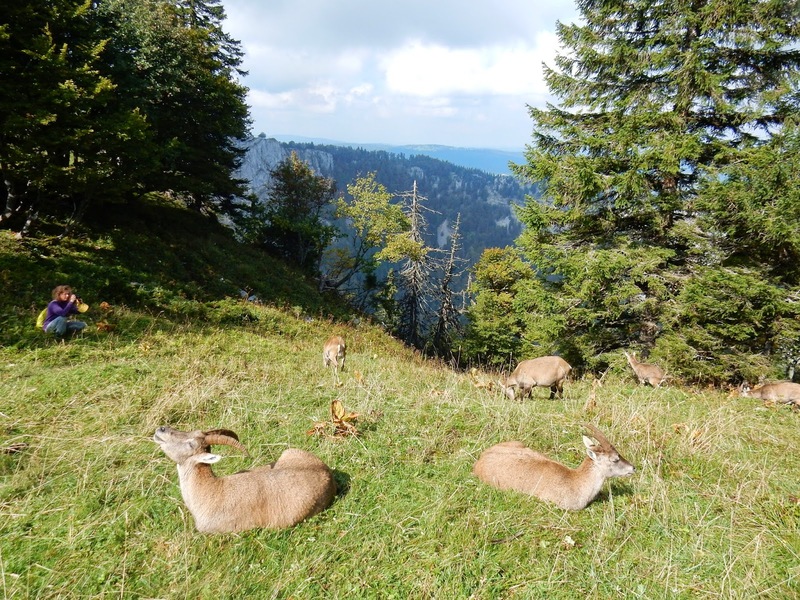 As a bonus, the students enjoyed mingling among the local cows and the chamois who calmly accepted their presence among them. 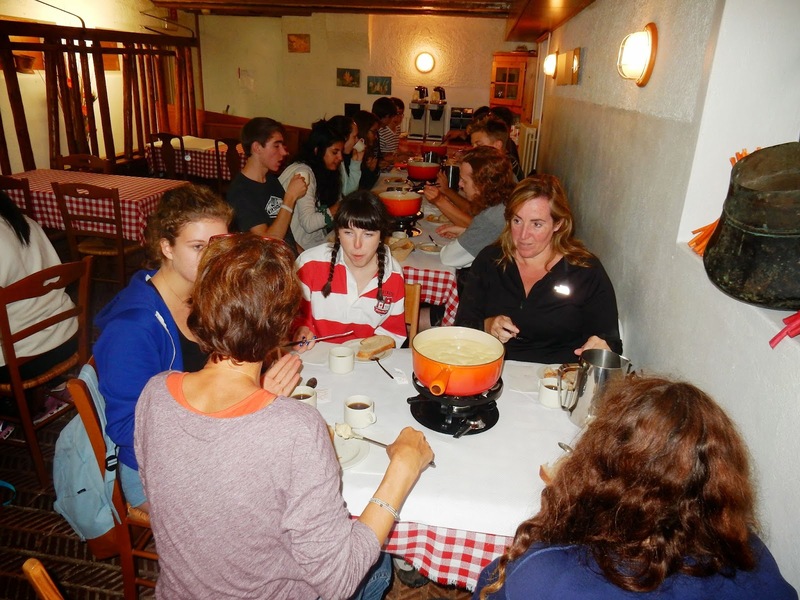 At the end of our respective journeys, both groups gathered at nearby restaurants for cheese fondue - well earned, for sure. 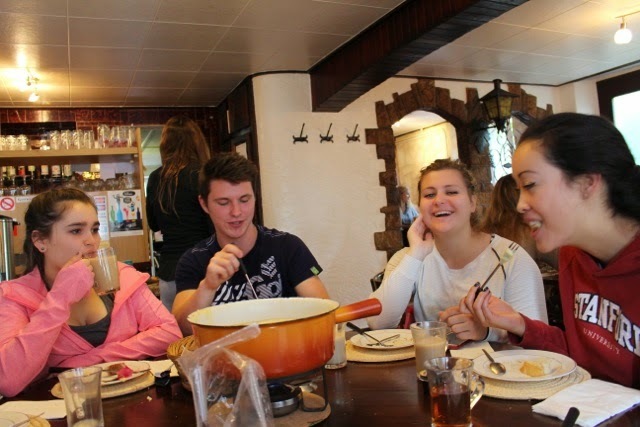 Fondue at Café du Pont.